The rules of Five Photos; Five Stories are to post a photo a day for five consecutive days and attach a story to the photo. It can be fiction or non-fiction, a poem or a short paragraph. Oh yes, and each day nominate another blogger for the challenge. Thanks to Dianna of These Days of Mine for tagging me to do this challenge. A great one for this time when I am feeling super busy and need a simple blog challenge. You have met them. Those characters who live life outside the box. Who refuse to conform. Who are comfortable in their own skin. Those who march to the beat of their own drummer. Meet Danny. 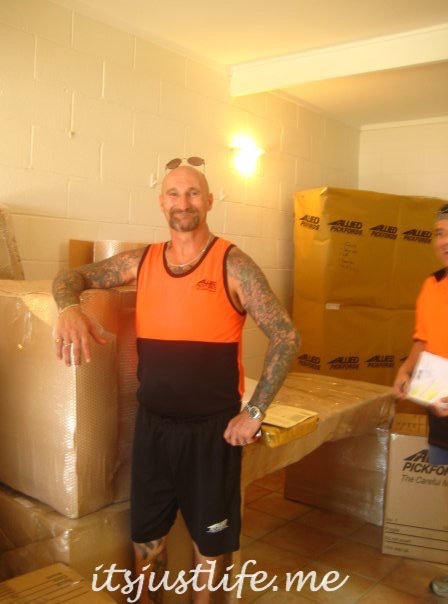 Danny was one of our removalists when we left Saunders Beach in Queensland, Australia. Danny was colorful Even without his tattoos he was colorful. He lived life full on. I could tell. He had an infectious smile and loved life. He loved his job and being with his mates. He treated our household items with respect and consideration and kept us amused at the same time. He happily posed for a picture for me and it reminds me of those days when they were packing us up, getting us ready to move back to the US where life would continue on to another adventure. Life is short. Grab those moments. Enjoy the characters who pass your way and remember to look beyond the outward appearance. I would like to share the fun and tag Katy of Learning As I Go in this challenge if she wants to participate. Great choice for a picture. I was going to nominate you but I see Dianna beat me to it. Look forward to the next 4 days. Thanks, Darlene. I was going to nominate you! Isn’t it a great challenge, though? I needed low stress about now and I have tons of pictures that can be used so this works for me! Great minds think alike. It is perfect for me right now too. I know! I need a few more of these. Challenge happily accepted because I’m feeling rather stagnant and at a lack of time to sit down and knock out quality posts right now, so perfect timing!! Thanks!! It is the perfect summer series, don’ t you think? I love it! Fun! I really love the sand dollar picture, by the way! Thanks, Gretchen! The sand dollar was from one of our many beach trips. I’ll be on the WA coast in a few weeks and look forward to finding sand dollars! Please do it!!! I can’t remember if I tagged you or not so if I didn’t please take it!!! Such a fun one. My best hairdresser ever sported an arm full of tattoos and pink hair. Unfortunately, she moved to the metro. Hate when that happens!!!! And I will be looking for a new one again! You can just see his personality shining through in that photo! He is such a character. We had so much fun with him!